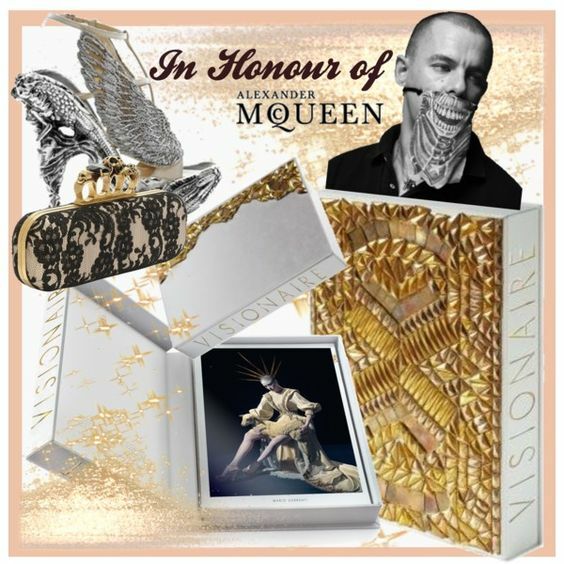 Visionaire, the art and fashion bible, has designed a gorgeous limited edition book in honour of the late Alexander McQueen with the contribution of some famous names like Nick Knight, Lady Gaga, Stephen Klein und Mario Testino. Only 1.500 numbered copies of the boxed set Visionaire58 Spirit, A Tribute to Lee Alexander McQueen will be available at Alexander McQueen boutiques and Colette for €1500.-. The reason why this is so pricey might be on one side the wrapping in a metalized brocade from the S/S 2010 show and on the other the paper quality. The pages are embedded with seeds that, if planted and watered, will bloom real flowers. How cool is that? If this is still not convincing, why not getting a great piece from the last collection that McQueen was working on before he comitted suicide last February. His beautiful fall pieces have already started to arrive in stores. So keep your eyes open. I am completely in love with the chevron-tweed jacket. It has a shredded silk trim which gives its classic cut a fierce twist. Combine it with motorcross leather pants plus a cool tank and upgrade the look with some drama by adding gorgeous heels and a studded clutch. If something is not available anymore, I recommend contacting McQueen directly or visit the online shop. Have fun shopping and paying your own tribute!